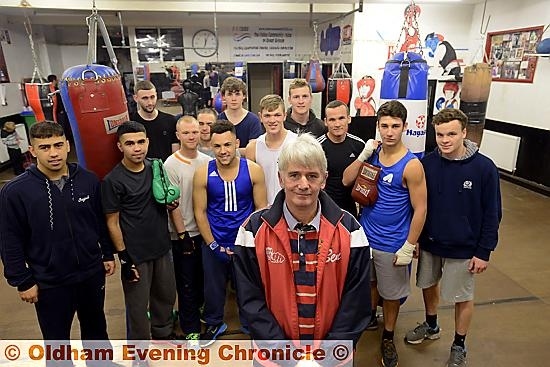 BEN Lancaster might not have been able to box as a youngster, but the popular head coach at the Boarshaw Amateur Boxing Club has more than made up for that disappointment over the last 30 years or so. Given the number of regional and national champions Lancaster has trained over the three decades, it seemed obvious that Ben must have had a strong careera s a boxer himself before turning to coaching. “It doesn’t affect me now, it’s been this way since I suffered a condition as a young child and had to have my left leg amputated. I can get around just fine – in fact most people don’t even realise I’ve got a false leg. “Of course, when a few of my mates started going to boxing classes at Boarshaw when we were all young, I wanted to join them. But I watched from the sidelines and eventually my love for the sport grew and grew. “Now I don’t know what I’d do without it. I’m consumed by boxing. I’ve enjoyed every minute of it and I’ve been all over the world with the lads I’ve trained. “Boxing has given me some great memories, and though I’m 54 now, I have no intention of giving up any time soon. Rival amateur trainers might not welcome Ben’s intention to keep churning out champions, for there have alreday been many down the years. His 20-year-old ABA coach registration booklet shows Ben’s own son Dean was his first North-West Counties king, in 1992. Since then regional and national champions have followed. There are some familiar Oldham boxing names in the booklet of success: Tommy Heffron, Grant Brown, Zac Burton and Kieran Farrell to name four. More recent glories have included two-time ABA champ Ronnie Heffron, Joe Murray, Danny Wright, Jack Kilgannon and Martin Grainger. There must have been lots of cherished memories for demolition worker Ben to savour since he took over as Boarshaw’s head coach in 1993. “Too many to mention really,” he says. “But one that sticks out is when we were in Sardinia at the European Union Championships in 2005 with Ronnie Heffron and he was stopping everyone in his path. There’s going to be plenty to keep Ben busy in 2014: John Newell is preparing to box for England, recent National Boys’ Club finalist Kilgannon will be kept busy, while the likes of Wright and Joe Eko are sure to continue their progress in the amateur rankings. Ronnie Heffron should be looking towards gaining a European or Commonwealth title shot very soon, while fellow Oldhamer Ashley Mayall secured the best win of his career a few weeks ago and will be desperate to build on that success.